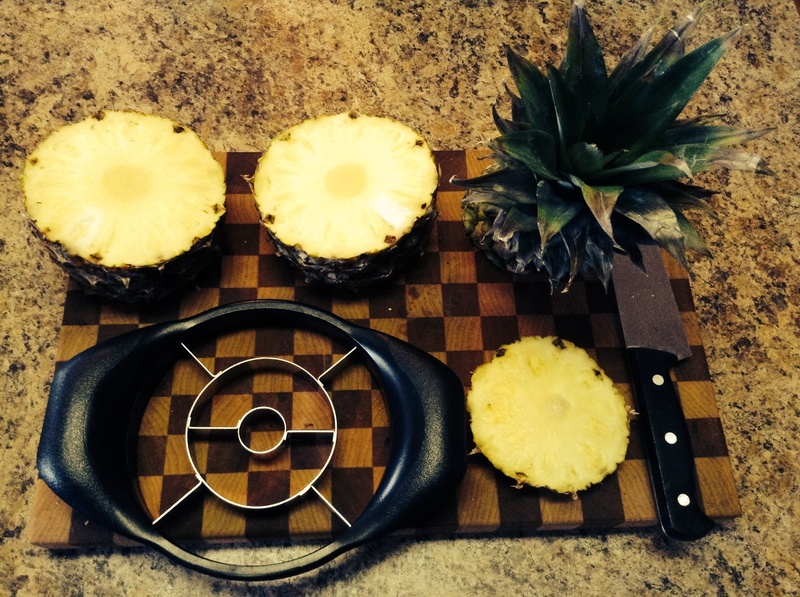 Cutting Up A Pineapple: Thank You Pampered Chef! 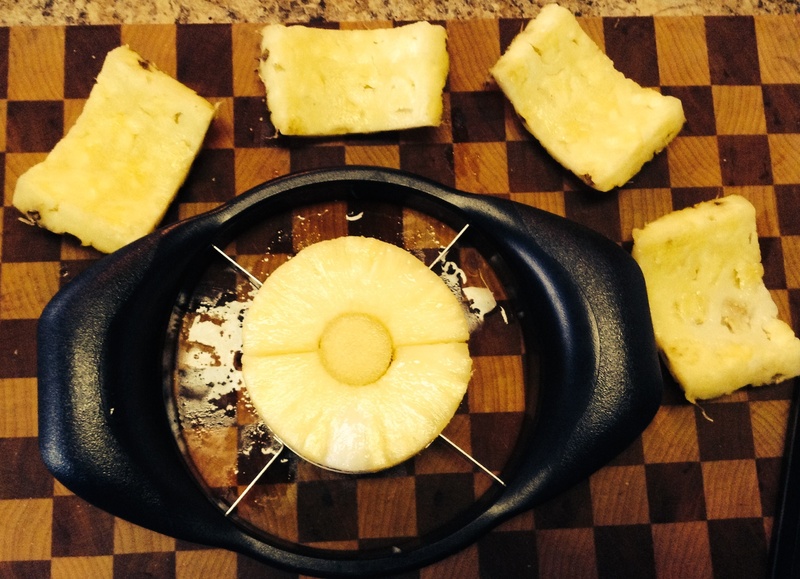 When I had my Pampered Chef online party in January, I had a few friends ask me if the Pampered Chef Pineapple Wedger was really that magnificent and easy. Of course, I told them it was because, in my honest opinion, it is. 🙂 Since I a few friends purchased one, I felt a duty to show them how to use it. Since I can’t be in their kitchens with them, side-by-side, demonstrating how to use it, I thought I would post pictures of the process. This post, in particular, is for and dedicated to my friend, Bethany. She was slated to come over to my house last week. The goal of our get together was not pineapple slicing. However, I had a fresh pineapple in the kitchen, so I told her that I would show her how I use my Pineapple Wedger while she was over. These plans quickly vaporized when our youngest woke up in the middle of the night puking his guts out. Yes, that was awesome. So, Bethany and my other Pampered Chef Pineapple Wedger purchasers, these pictures are for you! 1) Using a chef’s knife, I cut off the top, aka “the sharp poky leaves.” (Be careful, those things are dangerous.) Next, I cut off the bottom of the pineapple. For this step, only a minimum cut is required; this simply is useful for making the bottom level. 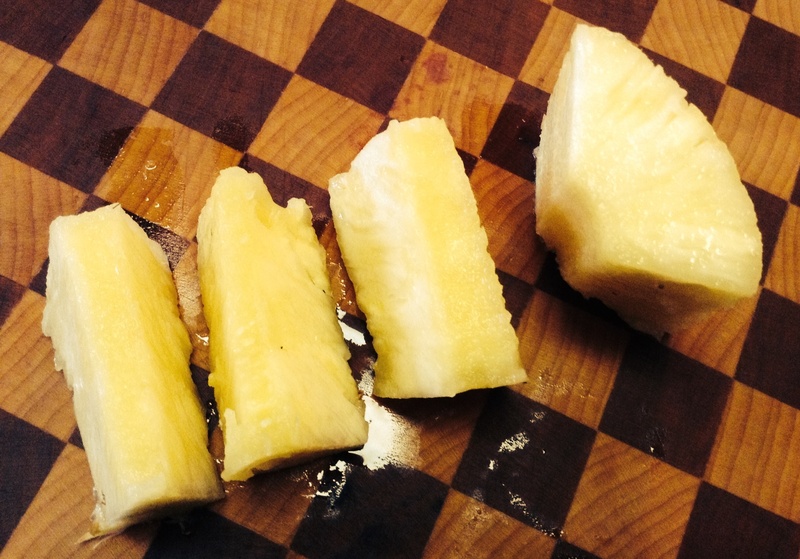 At the conclusion of this step, you have 2 halves of the pineapple remaining. See the two circles in the upper left hand corner of this picture. 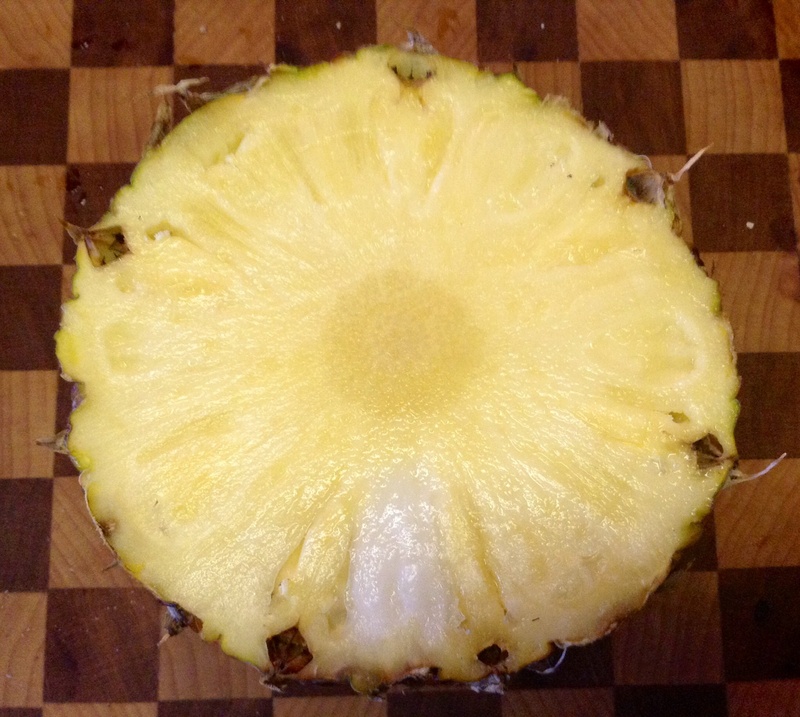 2) Locate the pineapple’s core. Do you see the dark yellow circle in the center? That’s your core! 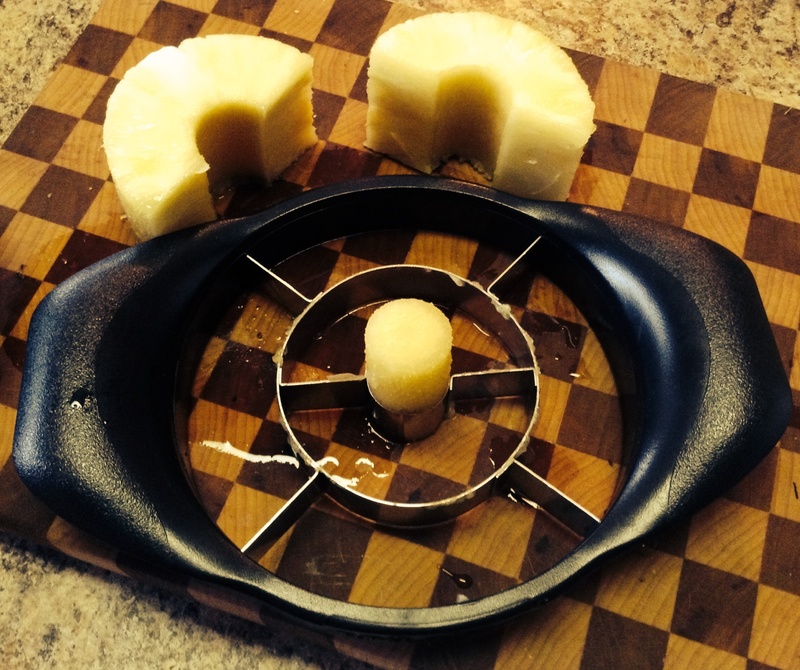 3) Line the circle of your Pineapple Wedger with the pineapple’s core…and press down. I usually gently rock the Pineapple Wedger back and forth as I press down. 4) Viola! Now, I pull the 4 pieces of pineapple peel away from the Pineapple Wedger. 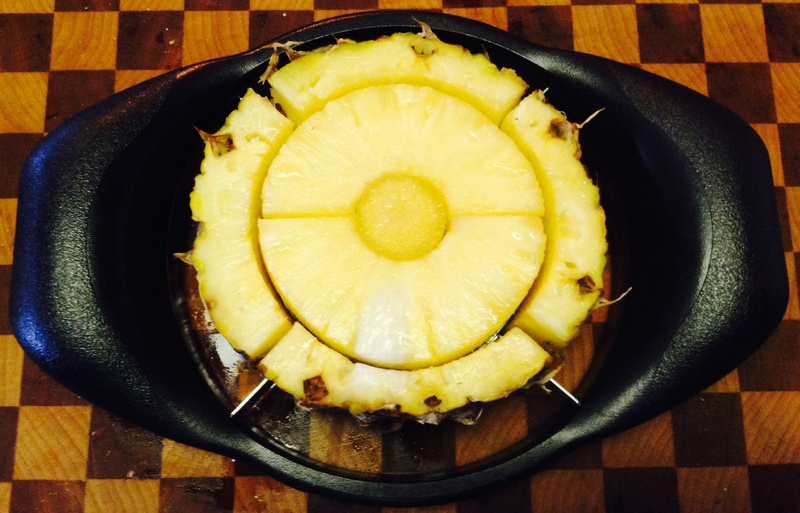 5) I remove the two halves of the pineapple from the Pineapple Wedger. All that is left in the center is the core. 6) Then, I slice and dice the fruit. I repeat these steps for the other half of the pineapple. 7) I practice oodles of self-control and do NOT eat an entire pineapple by myself. 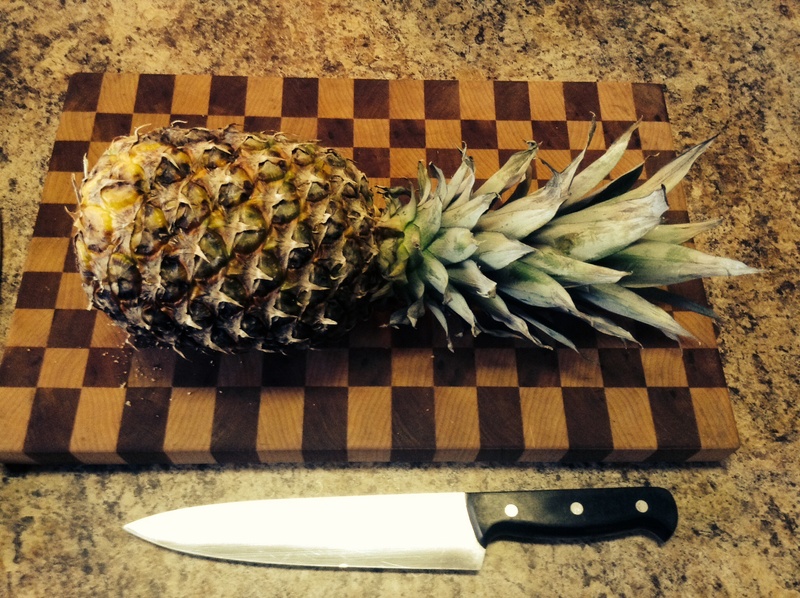 Be cautioned, fresh pineapple will not last long in your house. So, you may want to buy 2, 3, or 50 at a time! I especially like to purchase them when Aldi has them on sale for 99 CENTS! Wow!!! Next time I will buy one!! I love fresh pineapple.